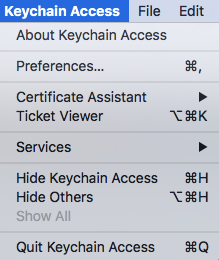 On my machine running OS X El Capitan, there is no "Keychain First Aid" option in the Keychain Access app. Where is Keychain First Aid?? It's possible that it was removed in the OS X 10.11.2 update. Reference: Keychain First Aid appears to be missing after 10.11.2 update! Impact: A malicious application may be able to masquerade as the Keychain Server. Description: An issue existed in how Keychain Access interacted with Keychain Agent. This issue was resolved by removing legacy functionality. In Mac OS X 10.11 El Capitan, Keychain errors can be fixed by deleting all files and folders in ~/Library/Keychains/ and rebooting. Guides that suggest "first aid" and renaming keychain files are misguided or outdated. Starting in OSX 10.11, you will need to open the Keychain Access app and go to Preferences > Reset My Default Keychain. "Reset" is a bit of misnomer; actually, it will move your old keychain to a separate database file, and create a new, clean keychain. Next, if you do File > Add Keychain, you can re-add your old keychain (for example, login_renamed_1) to the viewer. You can then manually copy over your keys from the old keychain to the new keychain. You will have to re-enter your root password for each key that you copy, and it will throw errors at you, but in the end they will get copied over. Not the answer you're looking for? Browse other questions tagged el-capitan keychain .